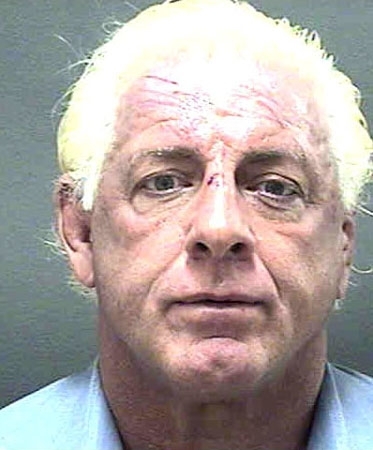 Wrestler Ric 'The Nature Boy' Flair surrendered to North Carolina cops on misdemeanor charges in November 2005 after being accused of throttling a fellow motorist during a road rage incident. The 56-year-old Flair (real name: Richard Fliehr) was booked by the Mecklenburg County Sheriff's Office, where the above mug shot was snapped. Flair, who allegedly grabbed a Charlotte man by the throat and kicked (and dented) the guy's Toyota during the confrontation, posted $1000 bond and was released. Submitted by Seahawksfan12 on Fri, 2011-03-18 02:53. To be the man, you gotta beat the man. Unfortunately, it looks like the man beat him. Submitted by SMS1967 on Thu, 2011-01-06 16:59. Submitted by Kedanna on Sat, 2010-08-28 23:45.